This is the second time that I’ve spent part of my summer in Sarteano. The majority of the workshop attendees stay at “Albergo Roberta,” which is a family-run hotel that has been hosting this workshop since it began. Coming back a second time was like coming back to a second family. We would have breakfast and dinner together everyday, and the food was nothing less than spectacular. Their homemade lasagna was good enough to give your mom a run for her money. Their wines varied in sweetness, none of them disappointing. My favorite dish, gnocchi, which is a “primo piatto,” was served twice that week and I had enough servings that I didn’t have room for the “secondo piatto”! After our 8am breakfast at the hotel, we would walk to “Società Filarmonica Sarteano,” which is a community rehearsal space in the town that we called our home for the week of rehearsals. During our time, we learned almost 20 pieces and concluded with a concert in Chiesa di San Francesco. It’s an alluring church with an echo time of about three seconds – which made our music that much more rich. I loved getting to know musicians from all around the world. Everyone brought different perspectives and life experiences, and it was intriguing to learn about all of them. This year, I met students from Germany, Italy, Croatia, Qatar, Hong Kong, Mexico, and various American states. We stayed up late almost every night because we genuinely loved hanging out with each other. Our evening get-togethers were sometimes as simple as hanging out on the hotel patio area discussing rehearsal that day. It’s exciting and humbling to have gained new friendships from all corners of the world. This piece, “Ave Maria” by Kevin Memley, was secretly my favorite. It had mixed views from many of us. The polyrhythms sometimes felt a little forced, it was difficult to tune, and it has arguably cheesy climaxes. But every time we ran through it, it made me feel like crying. I think it’s just one of those pieces that gets you, whether or not you know why. If I never get the chance to revisit this piece, our choir version will always hold a special place in my heart. The Sarteano Chamber Choral Conducting Workshop is under the direction of Brian O’Connell, Simon Carrington, and Bronislawa Falinska. I owe my experiences in Sarteano to Brian, who gave me the opportunity and highly recommended me to go. Brian, the director of the workshop, has received degrees from the Boston Conservatory; a Master’s Degree in Choral Conducting and a Certification in Voice Therapy. Simon Carrington co-founded The King Singer’s and he has worked at Yale, the University of Kansas, and the New England Conservatory. He was our Master Class Tutor for the week and aided the conductors with their pieces. Broni, our Vocal Tutor, received her diploma in Functional Voice Training and she specializes in Renaissance and Medieval music. This brief description of the amazing faculty only shows so much of the experience, talent, and passion they possess and I would highly recommend doing further research into their work. These past two summers in Sarteano have shaped my musical career and I’m incredibly grateful for what the workshops have given me. When I first started out as a music major, I never would’ve thought that I would have the opportunity for an experience this wonderful. To all my new friends: I hope to see you again soon, maybe even next year. Until then, ciao, and I can’t wait to hear of your accomplishments. THIS IS AN EXCITING OPPORTUNITY FOR MUSIC MAJORS! 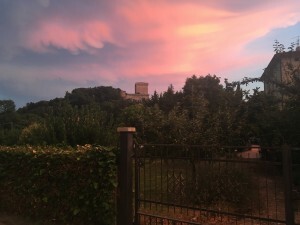 This summer for the first time, there will be two sessions of the Sarteano Chamber Choral Conducting Workshop in Tuscany, Italy. Two (or more) UMass Lowell music majors will be selected to participate in the workshop. Participation costs will be covered through a scholarship granted by the Sarteano workshop. Sing with choral musicians from all over the globe! Join Simon Carrington, Bronislawa Falinska and UMass Lowell Choral Director, Brian O’Connell for their eleventh consecutive year leading this workshop. 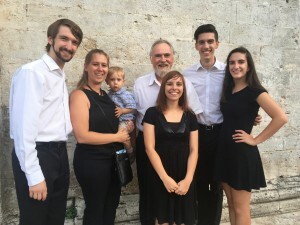 This intensive conducting workshop is geared for music educators and choral conductors with strong vocal ability that are interested in rehearsing and performing chamber choral music. You will be part of a 26-30-member ensemble that will prepare and perform a cappella choral music from the 16th to the 21st century. As a music educator or conductor seeking the experience of working and learning in a small group, you will have the opportunity to establish and develop relationships and to make music with other like-minded musicians. Creating a cohesive and musical ensemble in such a short time period is essential to the workshop, and we will focus on techniques to help facilitate this over the course of the workshop. Workshop sessions will be held in the Società Filarmonica. The first session (Musica Sacra) will culminate in a performance in the historic Chiesa di San Francisco, while the second session (mixed repertoire) will close with a performance in the beautiful Teatro di Sarteano. Read the Student and Faculty blog from their trip in 2014!